Oil prices opened the week at $52.55 on Tuesday following Martin Luther King Day in Monday. Prices were flat on Tuesday, but they slid to around $51/b on Wednesday. Prices on Thursday and Friday crept back into the neighborhood of $51.50. Today’s crude and product prices are continuing to increase, but perhaps not quickly enough to prevent the week from ending in the red. The EIA, IEA, and OPEC all expressed concern that rising crude supply in the U.S. and elsewhere could undermine the OPEC production cuts. OPEC announced that it had cut its December output by 220.9 kbpd. Saudi Arabia is pursuing the cuts aggressively, and its production figures indicate that it has already gone above and beyond what it had pledged. The price response has been lukewarm, however. The market may be waiting to see how many of the other participants take their cuts as seriously. The Saudi announcements, coupled with news from countries such as Kuwait and Venezuela, did seem to nudge prices back above $51.50/b. A compliance committee meeting is scheduled for this weekend, which seems likely to have a psychological impact at least on prices today. There is a spreading unease about global supply expansion in 2017. A high level of OPEC-11 and NOPEC-11 compliance will be needed to counteract this. The EIA reported a crude stock build of 2.347 mmbbls crude, a gasoline stock build of 5.951 mmbbls gasoline, and a distillate drawdown of 0.968 mmbbls. WTI crude prices opened at $51.55/b this morning, a 2.1% decrease from Tuesday’s opening of $52.55/b. Prices ranged from a high of $53.52/b on Tuesday to a low of $50.91 on Wednesday. This is a range of $2.61. WTI prices are $52.06/b this morning, $0.69 above yesterday’s close. Prices appear to be continuing up in early trading. Distillate prices opened Tuesday at $1.6526/gallon. They opened this morning at $1.6197/gallon, a drop of 2.0% (3.29 cents) for the week. Prices ranged from a low of $1.6044/gallon on Wednesday to a high of $1.6957/gallon on Tuesday, a range of 9.13 cents. Prices are currently $1.6394/gallon, 2.11 cents above Thursday’s close. 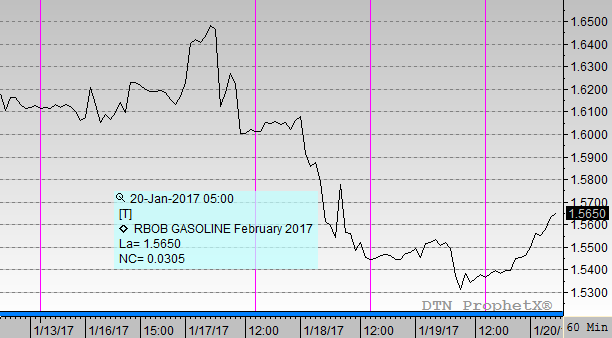 Gasoline RBOB prices opened Tuesday at $1.6087/gallon. 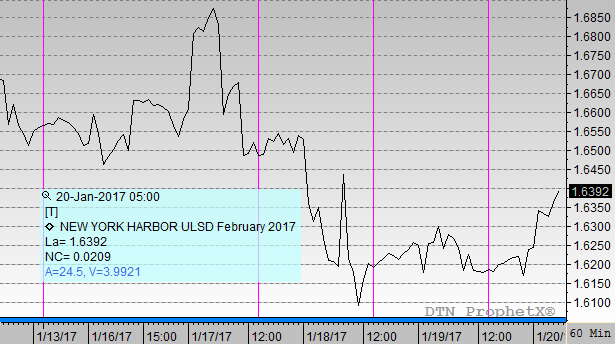 Today’s opening price of $1.5455/gallon was a serious drop of 3.9%, or 6.32 cents, for the week. Prices ranged from a low of $1.5263/gallon on Thursday to a high of $1.6624/gallon on Tuesday, a very wide range of 13.61 cents. Prices are $1.5661/gallon currently, a recovery of 3.16 cents above Thursday’s close.